Commercial Service Airports—publicly owned airports that have at least 2,500 passenger boardings each calendar year and receive scheduled passenger service. Passenger boardings refer to revenue passenger boardings on an aircraft in service in air commerce whether or not in scheduled service. The definition also includes passengers who continue on an aircraft in international flight that stops at an airport in any of the 50 States for a non-traffic purpose, such as refueling or aircraft maintenance rather than passenger activity. Passenger boardings at airports that receive scheduled passenger service are also referred to as Enplanements. Cargo Service Airports—airports that, in addition to any other air transportation services that may be available, are served by aircraft providing air transportation of only cargo with a total annual landed weight of more than 100 million pounds. “Landed weight” means the weight of aircraft transporting only cargo in intrastate, interstate, and foreign air transportation. An airport may be both a commercial service and a cargo service airport. Reliever Airports—airports designated by the FAA to relieve congestion at Commercial Service Airports and to provide improved general aviation access to the overall community. These may be publicly or privately-owned. General Aviation Airports — the remaining airports are commonly described as General Aviation Airports. This airport type is the largest single group of airports in the U.S. system. The category also includes privately owned, public use airports that enplane 2500 or more passengers annually and receive scheduled airline service. Civil Airports—airports that are open to the general public. Military/Federal Government airports—airports operated by the military, National Aeronautics and Space Administration (NASA), or other agencies of the Federal Government. Private Airports—airports designated for private or restricted use only, not open to the general public. A towered airport has an operating control tower. Air traffic control (ATC) is responsible for providing the safe, orderly, and expeditious flow of air traffic at airports where the type of operations and/or volume of traffic requires such a service. Pilots operating from a towered airport are required to maintain two-way radio communication with ATC and to acknowledge and comply with their instructions. Pilots must advise ATC if they cannot comply with the instructions issued and request amended instructions. A pilot may deviate from an air traffic instruction in an emergency, but must advise ATC of the deviation as soon as possible. A nontowered airport does not have an operating control tower. Two-way radio communications are not required, although it is a good operating practice for pilots to transmit their intentions on the specified frequency for the benefit of other traffic in the area. The key to communicating at an airport without an operating control tower is selection of the correct common frequency. The acronym CTAF, which stands for Common Traffic Advisory Frequency, is synonymous with this program. A CTAF is a frequency designated for the purpose of carrying out airport advisory practices while operating to or from an airport without an operating control tower. The CTAF may be a Universal Integrated Community (UNICOM), MULTICOM, Flight Service Station (FSS), or tower frequency and is identified in appropriate aeronautical publications. UNICOM is a nongovernment air/ground radio communication station that may provide airport information at public use airports where there is no tower or FSS. On pilot request, UNICOM stations may provide pilots with weather information, wind direction, the recommended runway, or other necessary information. If the UNICOM frequency is designated as the CTAF, it is identified in appropriate aeronautical publications. 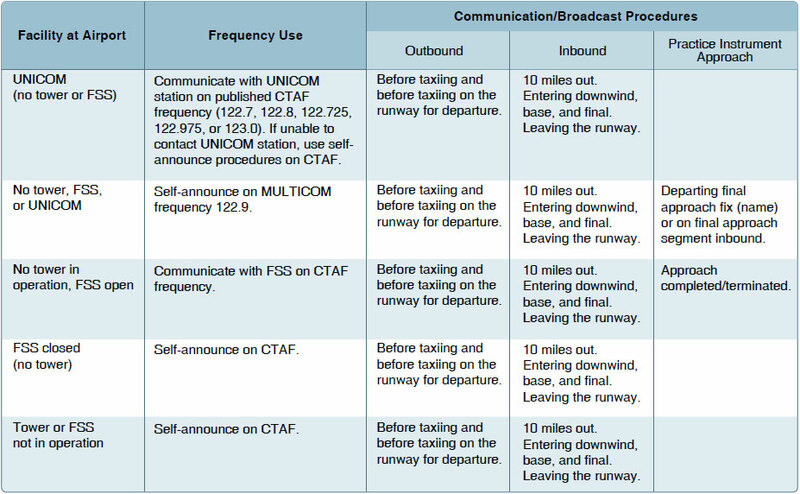 Figure 14-1 lists recommended communication procedures. Nontowered airport traffic patterns are always entered at pattern altitude. How you enter the pattern depends upon the direction of arrival. The preferred method for entering from the downwind side of the pattern is to approach the pattern on a course 45 degrees to the downwind leg and join the pattern at midfield. Figure 14-2. Preferred Entry-Crossing Midfield. 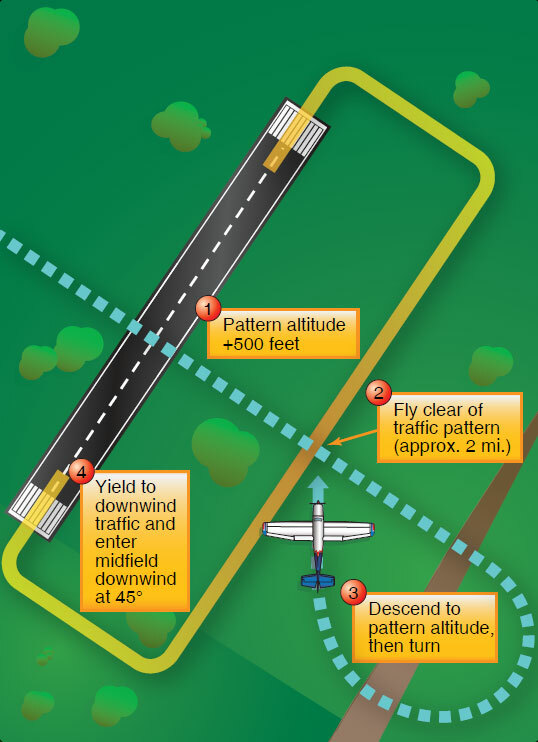 An alternate method is to enter on a midfield crosswind at pattern altitude, carefully scan for traffic, announce your intentions, and then turn downwind. [Figure 14-3] This technique should not be used if the pattern is busy. 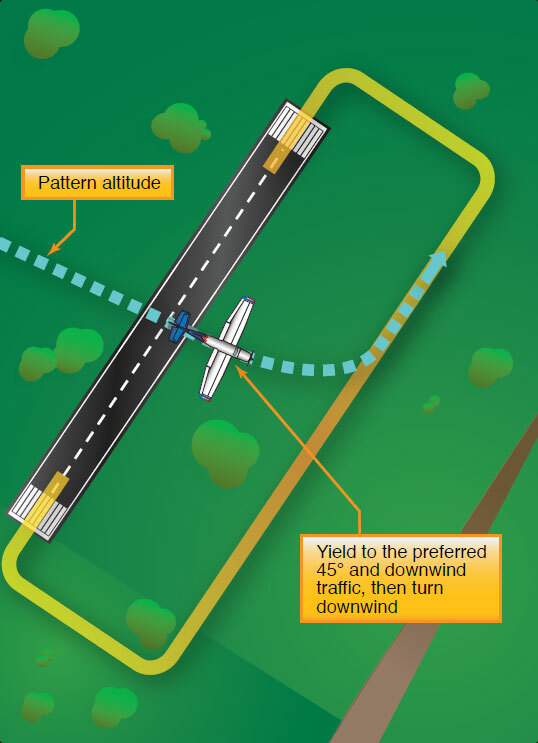 Always remember to give way to aircraft on the preferred 45° entry and to aircraft already established on downwind. Figure 14-3. Alternate Midfield Entry. In either case, it is vital to announce your intentions, and remember to scan outside. Before joining the downwind leg, adjust your course or speed to blend into the traffic. Adjust power on the downwind leg, or sooner, to fit into the flow of traffic. Avoid flying too fast or too slow. Speeds recommended by the airplane manufacturer should be used. They will generally fall between 70 to 80 knots for fixed-gear singles and 80 to 90 knots for high-performance retractable.